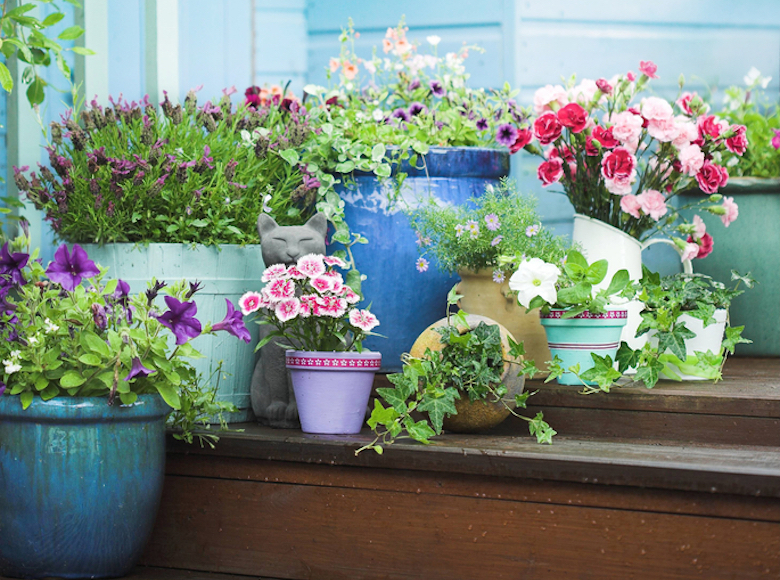 House your summertime blooms in terracotta pots for an added bit of colour in the garden. Growing your favorite plants in containers is the perfect way to add shape, colour and texture to your garden, patio or decking. They're also a great way to stop rambling plants from overgrowing, and they're ideal for small spaces like balconies or courtyards. Here we provide suggestions for plants to grow and offer tips to help you get the most from your containers. 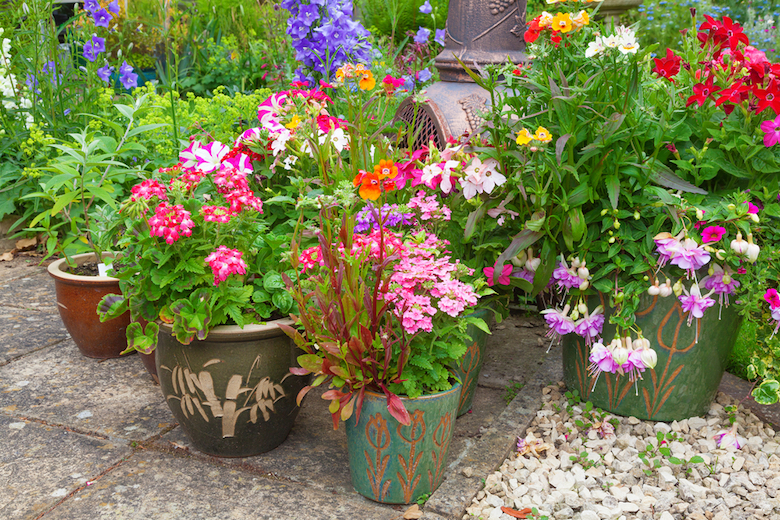 Picking the right kind of container is crucial for keeping your plants alive and thriving. Choose a container that's best suited to what you want to grow and where you're going to put it. 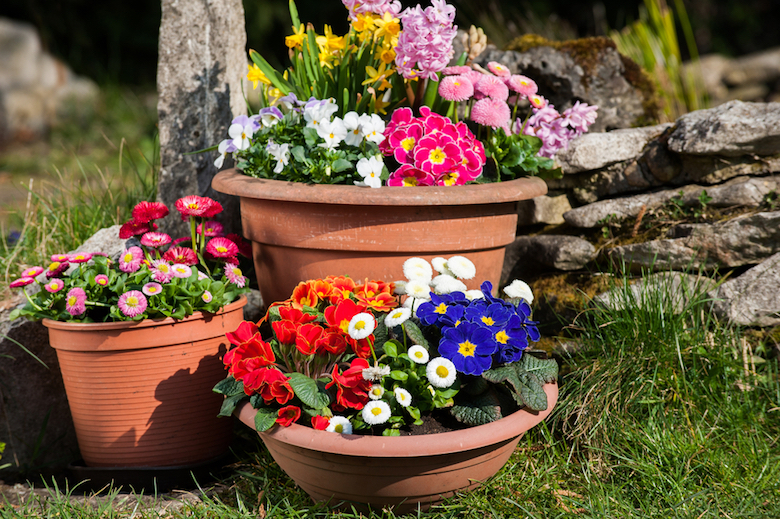 Sturdy terracotta or clay pots, for example, are ideal for growing shrubs and perennials, but because they're porous, soil can dry out quickly, making them a less suitable for growing plants that like plenty of water. They're also heavy, making them a poor choice if you're likely to want to move the pot regularly, or if you're growing plants in containers on fragile decking. For plants that like moist soil, consider planting them into plastic, or glazed pots which are better at retaining water. Wooden planters help to keep the soil and roots at a stable temperature, and while stone pots make a fantastic architectural statement, they don't lend themselves to being moved once installed. Always choose a container that's big enough to give plants room to grow. Shrubs, trees and perennials in particular, need plenty of space for their roots. 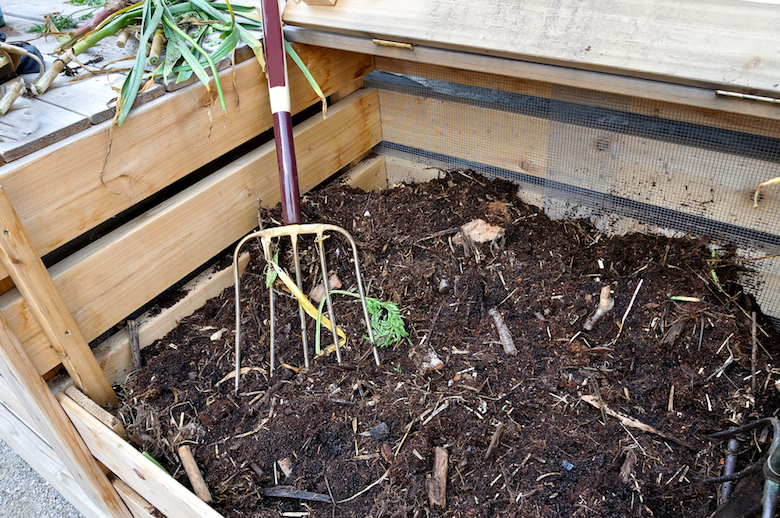 A good multi-purpose compost is sufficient to see many plants thrive in containers, but they will begin to fade unless you feed them regularly. Either apply a slow-release plant food to the surface of the compost each year, or apply liquid fertiliser regularly through the growing season. If you're growing shrubs and perennials, a loam-based compost is probably best. The heavier soil offers better stability for taller plants, and retains water well. Acid loving plants like blueberries and camellias will benefit from an ericaceous compost, watered with rainwater, rather than tap water. To prevent excess moisture loss, consider mixing water retention granules into the compost before you plant your containers, and once plants are established, you may wish to apply a top dressing of gravel, stones or wood chips to the soil surface to stop moisture evaporating so quickly. Stunning Pink Dianthus facing the sun. These annuals look particularly lovely in containers. 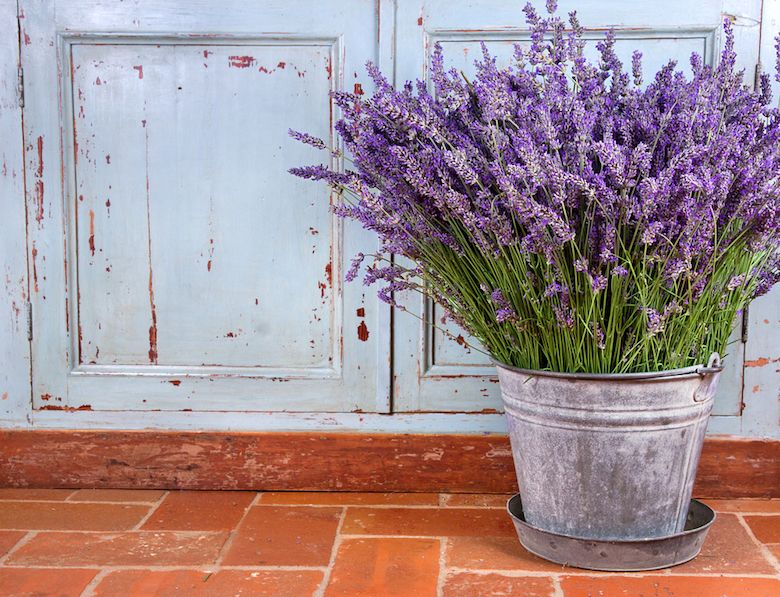 Get planting, and have the relaxing scent of lavender fill your garden this summer. 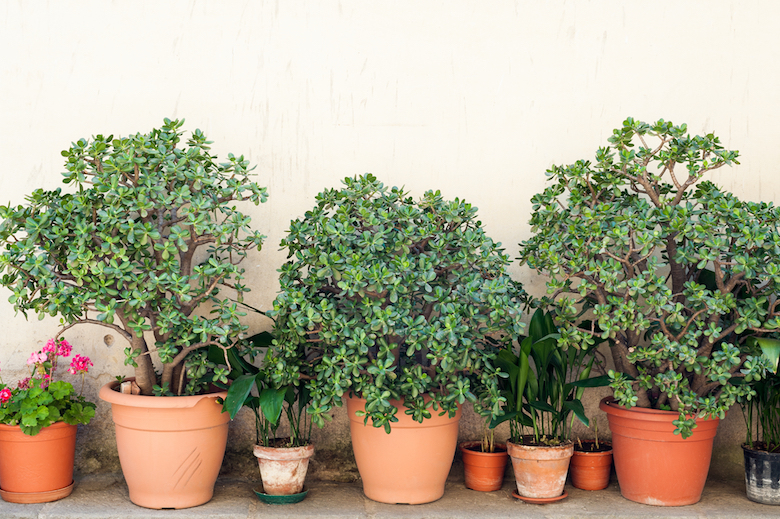 From planting small trees to plugging gaps, containers offer a wide range of positives for any garden. 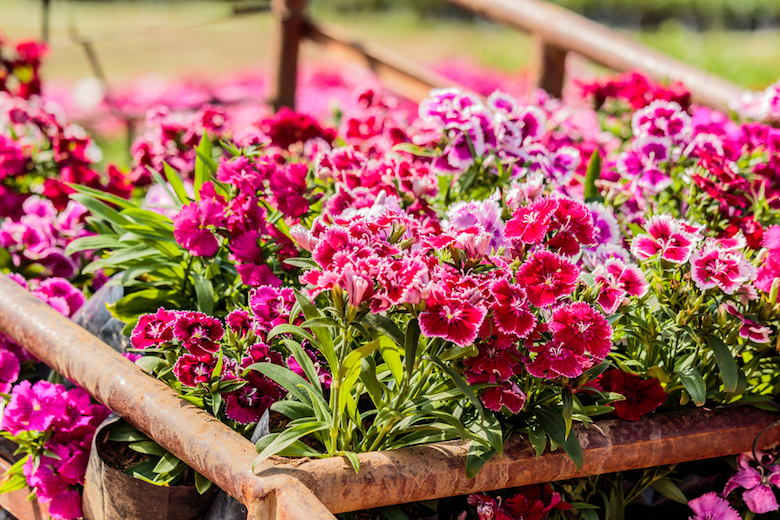 Containers are so versatile, offering the chance to grow anything from bedding plants to shrubs, fruits, vegetables and even small trees. Planting a good mix of upright plants, with trailing plants close to the edges makes for a riot of colour which cascades from the pot. Single plants also work well, making a bold, architectural statement, or alternatively, use containers to brighten up a fence or wall by growing climbing plants like climbing roses, clematis and sweet peas. Lost plants to a sudden downpour or a late frost? Adding containers to your borders instantly plugs gaps, ensuring your garden always looks its best. In fact, sinking plant pots into your borders is a great way to enjoy decorative grasses and bamboos without risking them spreading out of control. And what better way to enjoy tender plants than to grow them in pots you can move into the garden for the summer, before taking them back into the greenhouse to keep them safe until next year? 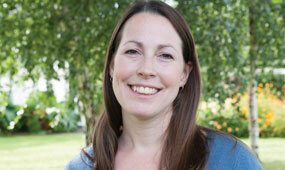 If you'd like a little more information, download our 'Annual plants for containers' pdf. What do you like to grow outside in containers? We'd love to hear your tips for gardening this way. 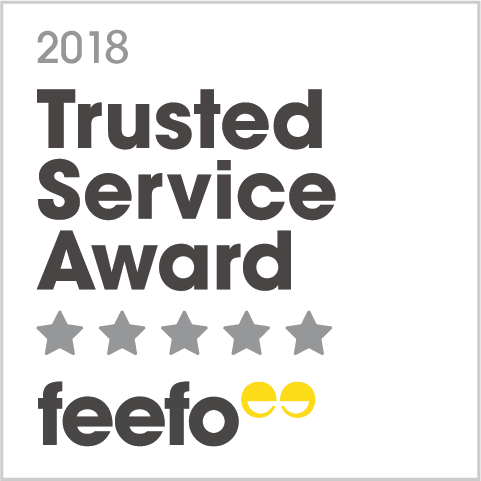 Just head on over to our Facebook page and drop us a line.